At least three people have lost their lives when a US drone carried out a strike in the eastern part of Afghanistan on the border with Pakistan. Kamran Afridi, a local official in the Pakistani border town of Miran Shah, said the deadly drone strike was carried out on the Afghan village of Gurowek in Khost province on Wednesday. According to the Associated Press, militant sources confirmed the attack, saying a compound targeted in the strike belonged to a local Taliban commander. The CIA spy agency has used hundreds of drones to conduct surveillance flights and airstrikes since Washington and its allies invaded Afghanistan in 2001. The airstrikes, initiated under the administration of former US President George W. Bush in 2004, were escalated during former US President Barack Obama’s term in office. 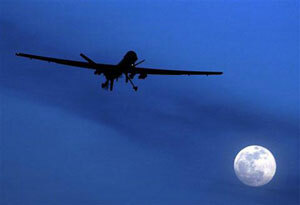 The drone strikes have been carried out in Pakistan, Afghanistan, Yemen, Somalia, Libya and elsewhere. US President Donald Trump recently gave the CIA new authority to launch drone strikes across various parts of the world in line with Washington’s so-called war on terror. The United States claims the airstrikes target members of terrorist groups such as al-Qaeda but according to local officials and witnesses, civilians have also been the victims of the attacks in many cases.